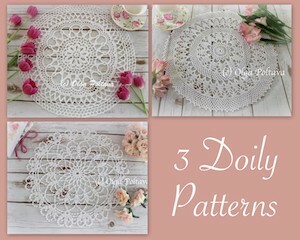 I really enjoy receiving your emails and photos of your crochet projects made from my patterns. 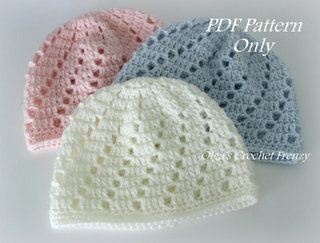 If you would like me to share them on my blog, please mention so in your emails. 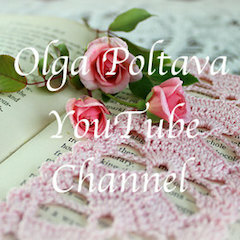 And if you have a blog or a Facebook page, I will gladly link back to it. 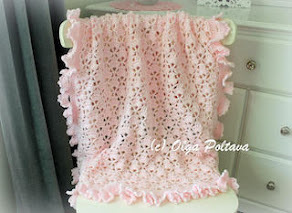 Today I'm sharing with you photos of a baby blanket made by Sharon. 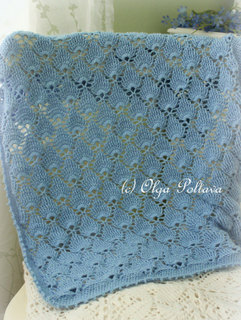 For the main stitch she used my pattern for Lacy Baby Blanket. 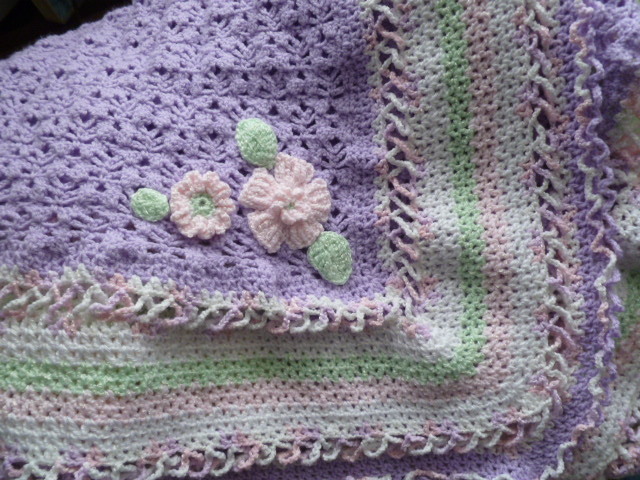 And she was very creative and come up with a beautiful wide border and added some flowers and leaves to the blanket. 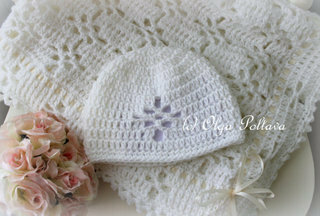 Wonderful job Sharon, and thank you for letting me share your photos so that others can be inspired too! 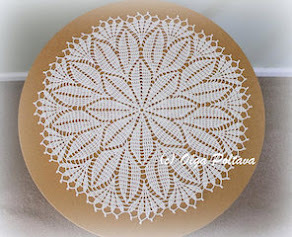 I'm taking a little break from doily making. Here in California, spring is just around the corner. A lot of trees are in bloom already. 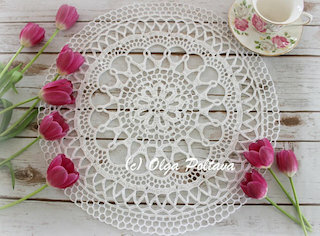 So I am in the mood for some flowers! 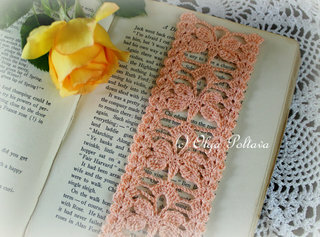 Ch 10. Join in ring with sl st. Round 1: ch 3, 23 dc in ring. 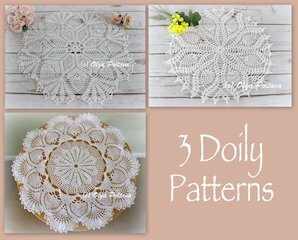 Join with sl st to 3rd ch of beginning ch-3. Round 2: ch 1, sc in same space, sc in each dc around. Join with sl st to 1st sc. Round 3: ch 6, dtr in same space, *ch 5, skip next 2 sc, 2 dtr in next sc* around. Join with sl st to 6th ch of beginning ch-6. Round 4: ch 1, sc between starting chain and next dtr, * (2 hdc, 2 dc, 3 tr, 2 dc, 2 hdc) all in next ch-5 loop; sc between next 2 dtr* around. Repeat from * around. Join with sl st to 1st sc. 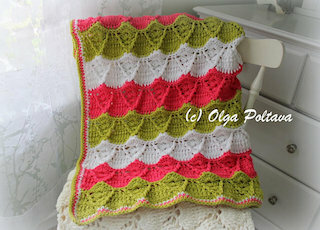 I often get emails regarding Fancy Shells Baby Afghan that I made and posted the pattern back in November 2013. 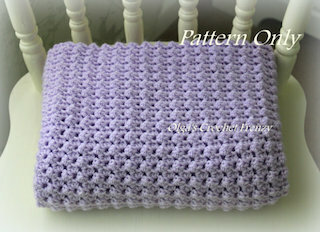 I couldn't come up with a border/trim for that afghan even though I had tried several times. 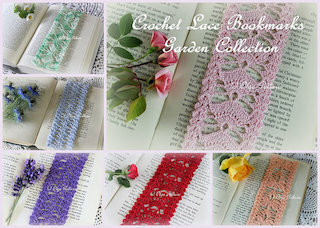 But one of the best parts about online crochet community is that we can share our knowledge and ideas with each other. 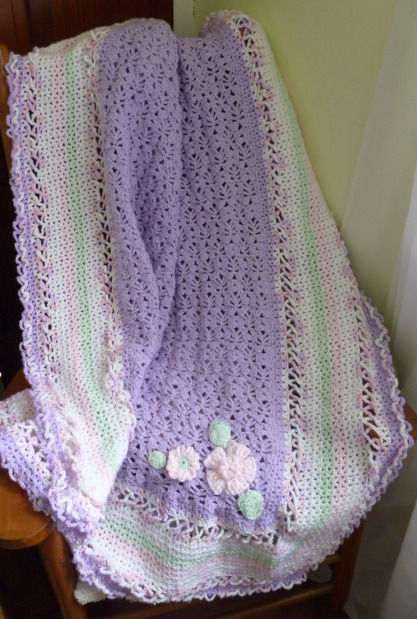 The baby afghan shown bellow was made by Christina Marie (you can see more of her beautiful crochet work on her Facebook page). 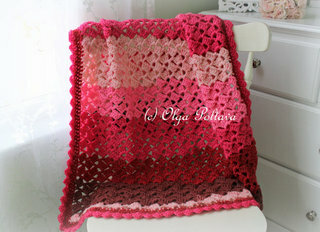 Isn't this baby afghan gorgeous? 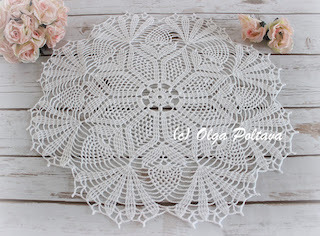 I really love that ruffled lace border. 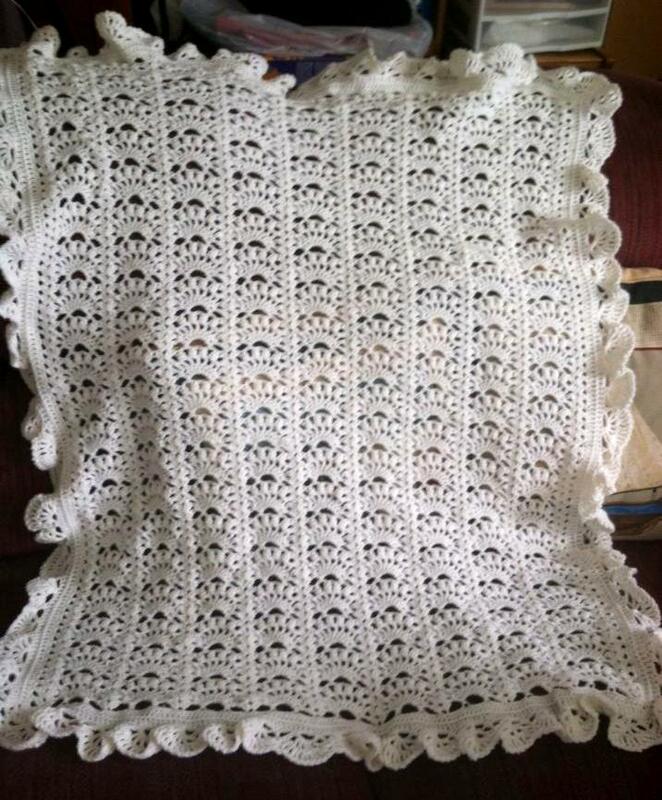 Christina Marie used instructions from a different baby blanket, and the free pattern is available online (you can see it here). Thank you Christina Marie for sharing your work with us. 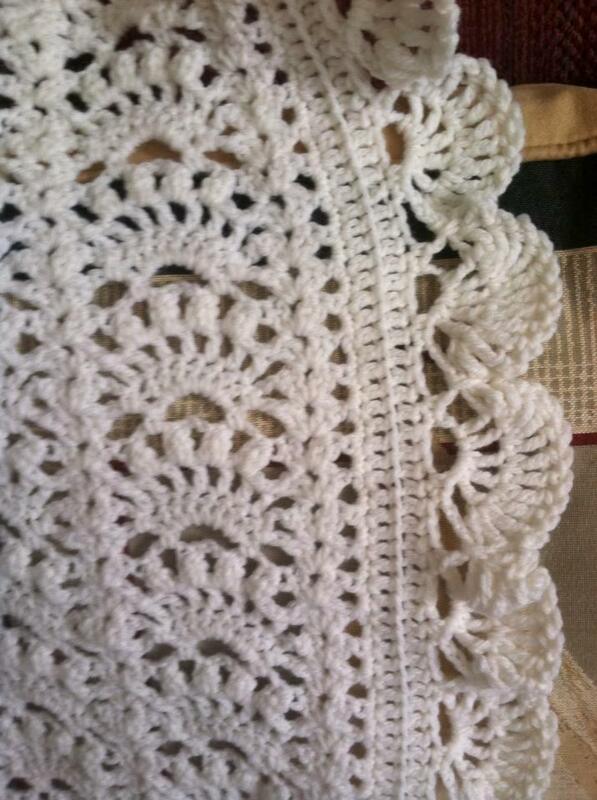 I absolutely love it when others crocheters send me pictures of their projects made from the patterns on my blog. So you if you would like to share yours, don't hesitate to email me.